Your first urge might be to go and check if it’s real. The nameless painting (2004) reminiscent of a large scale weather-chipped US advertisement for something that could be a motel in, for instance New Mexico, is incredibly authentic with its optic of a peeled-off enamel and bleeched paint, coroded spots and the uneven shades of one colour. Aware of its impact on visitors, the staff of Essl Museum has set up the warning “please, do not touch the artwork”, just a couple of inches short of this oil on wooden panel. Unless you’re Austrian, it is hardly likely that you’ve ever heard of Franz Zadrazil (1942-2005) before. But, as you slowly approach his 130×130 large oil on novopan Pintchik Country (1984), you might be slightly surprised by the sudden feeling of déjá vu. The next thing you know, you’ll be thinking of Desperate Housewives, or rather – of a short, but eye-catching glimspe of the Pintchik Country mural in its opening credits. As one moves through the exhibition’s rooms, more paintings of building facades, antiquitated advertisements, grafitti and architecture in “decay” – coroded constructions, crumbed walls and areas of wear and patination, unfold in front of one’s eyes. The absence of people is noticeable. Zadrazil was, after all, interested in depicting, as Angela Stief describes in her essay ‘Faces of facades’ – “human solitude and isolation amidst the hubbub of modern life”. 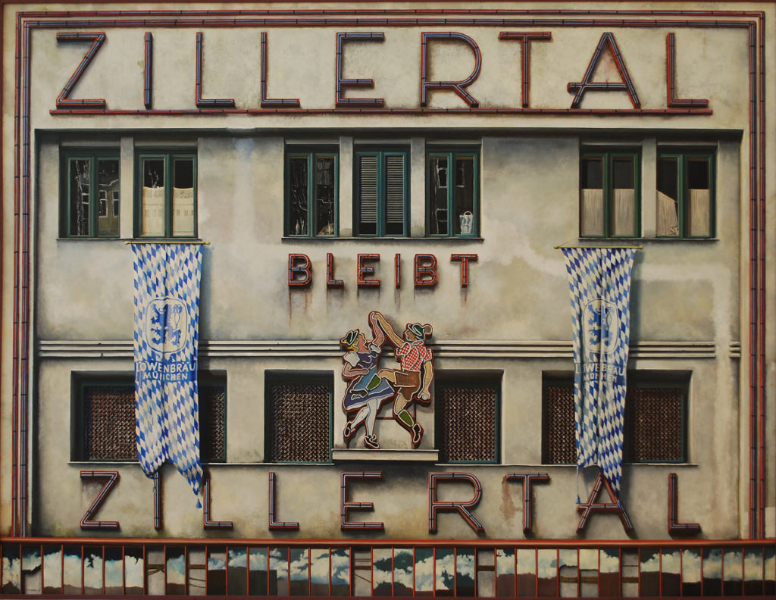 Born 1942 in war-torn Vienna, from the moment he took a paintbrush in his hand, Zadrazil was attracted by big cities’ symbols of decay and buildings with “a bit of story to tell”. He portrayed the hidden or forgotten corners of Vienna, Paris and New York, showing their least flattering faces with warm affection. Exhibition ‘Franz Zadrazil’ is open until 28th October.